Deep within the serpentine chasm of Wire Pass, the sandstone walls narrow to a passage just 2 feet wide. The curving rock is luminous, glowing in shades of red as the labyrinth winds for a half-mile before opening to an amphitheater-like expanse beneath towering cliffs. The amphitheater sits at a junction with Buckskin Gulch, considered the world’s longest slot canyon. On our day trip out of Kanab, Utah, we intended Wire Pass to serve as a prelude to a trek to the Wave, a famous formation where the rock curls and swirls like a fossilized Banzai Pipeline. But with two branches of the gulch waiting to be explored (13 miles in all), one thing has become clear. “I don’t think we’re going to make it to the Wave today,” I say to my friend Tom. Easily distracted by beautiful places, we’re used to switching up our travel plans at the last minute. And, as we’ve discovered on this trip to Kanab country ― a region along the Utah-Arizona border, long considered a gateway to Bryce, Zion, and other national parks ― this oft- overlooked area is home to a few world-class destinations of its own. 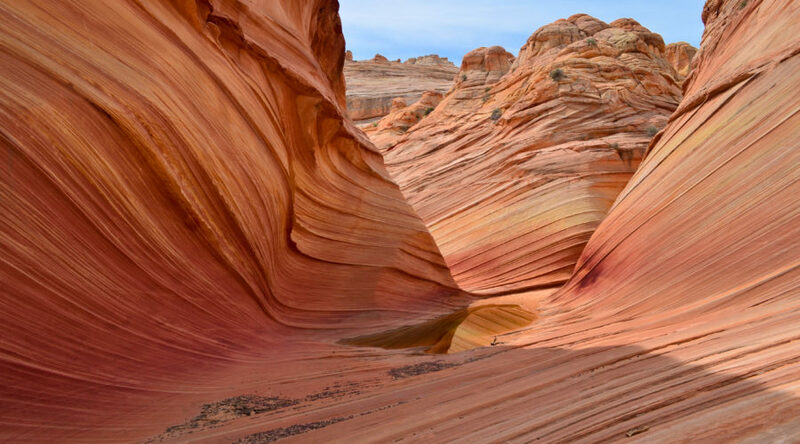 So instead of making a beeline for Kanab’s big-name neighbors, as most travelers do, we decided to book a room in town and use it as a base from which to explore parts of Grand Staircase-Escalante National Monument ― plus the Wave, Wire Pass, and Coral Pink Sand Dunes. In fact, we’re having a hard time seeing all we want to see, including a few highlights in Kanab itself. The dusty streets may lack the eco-chic of such brand-name Utah spots as Moab, but for some residents, its authenticity is part of the appeal. Set beneath the Vermilion Cliffs, Kanab boasts an impressive pedigree. John Wesley Powell wintered here during his explorations down the Colorado River, and artist Maynard Dixon lived and painted in nearby Mt. Carmel. Hollywood filmmakers also discovered the area and used its monumental mesas and buttes as a backdrop for classic westerns. Today, travelers from around the world are discovering the area. European tourists frequent the cafe, as well as visitors from South Africa, Israel, and South America. “There are days it’s like the UN,” says Cooper with a smile.